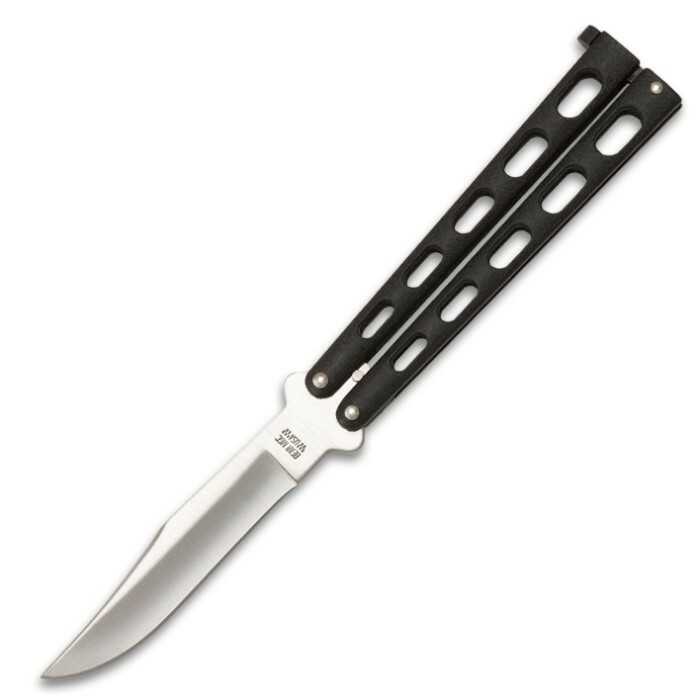 Bear & Son Butterfly Knife Black Die Cast Handle | BUDK.com - Knives & Swords At The Lowest Prices! 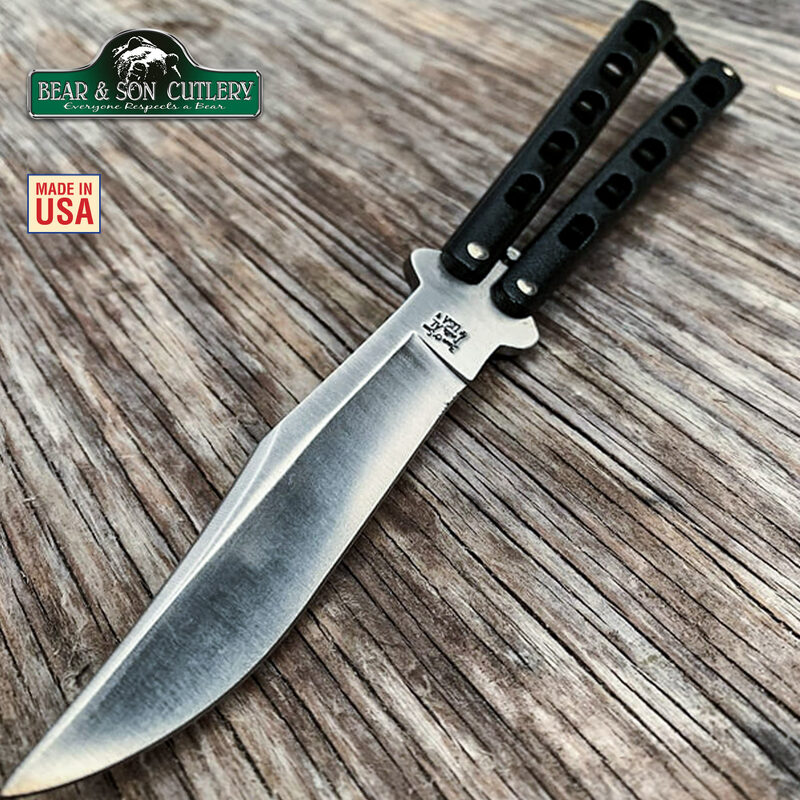 This Butterfly knife by Bear and Son Cutlery is light and durable and a perfect fit for anyone! It features a 5” hollow-ground, stainless steel blade and black die cast handles. Each Bear & Sons knife is handcrafted in the USA in Jacksonville, Alabama. This item cannot be sold in CA, HI or NY. Sister got it for me for my first butterfly, handles both broke at three months. Overall good knife. But its built for use, not abuse. Beginners be warned. Nothing beats the feel of die-cast, but for durability stay very far away from die-cast. That said, overall great knife, thx bear, after five months I am now an advanced flipper and competing in local competitions. I will be purchasing their products in the future. Not exactly top quality ... but for 29.98 and free shipping ... it's well beyond what one would expect for that price. My only complaint (ergo four v five stars) is the latch, which is exceedingly loose. Would I purchase this again? For the price paid? Yes! Ive had this knife for 2 years now and carry it almost every day, it hasnt chipped fallen apart or dented in anyway. This is my overall favorite knife because the durability and fun it brings. My only complaints are how loud it is, and its not as smooth as other butterfly knifes, but for less than 40 bucks this is the best your can get. Works Wonderfuly, And The handles feel great in your hand. I purchased this knife for my wife and had her nickname engraved on it. It looks FANTASTIC! Pros. -PRICE! -super sharp! -great weight and fairly good balance, though a bit heavy on the handle side imho. 149.0g -good quality steel -drop point is angled nicely. -handles feel good -engraving is super easy to read on this knife! Cons. -latch is a bit sticky, just have to keep flipping it and I used some WD40 and it loosened up a fair amount. The wife loves it and I am very satisfied with this purchase. 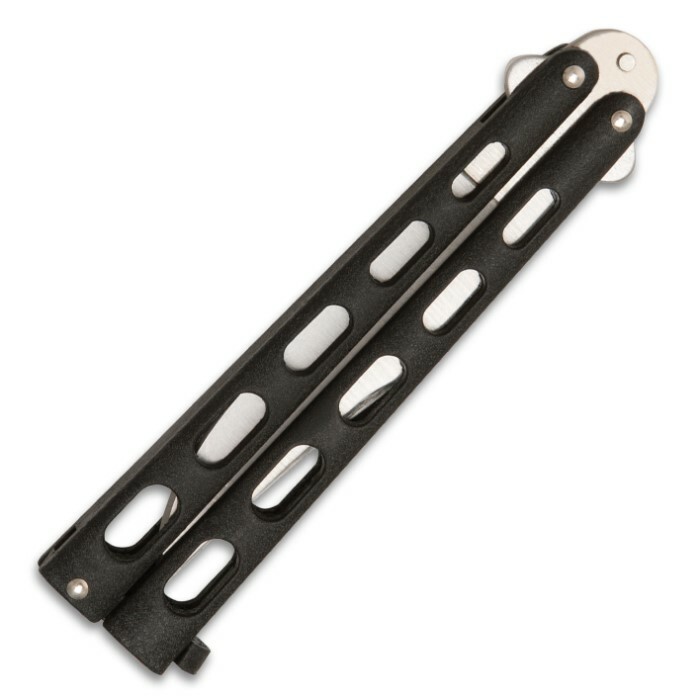 Havnt had a "real" balisong since the 1980s. Very satisfied with my purchase. Recommended! It's a very good knife for beginners if you want to flip it, I wouldn't recommend it for a EDC, it has lasted me 2 years and it's still going strong with a lot of scratches on the safety lock or pin.